The significance of pig feed conversions in modern pig production is a key to operating a successful commercial farm. As feed costs and other overhead increases, turning quality pig feed into weight gain is an absolute necessity to turn a profit. Feed conversion ratio (FCR) or feed conversion efficiency (FCE) is a formula that measures the amount of food that is needed by an animal to convert that food into one pound of body weight. Also, FCR is the feed used, not just eaten, per pound of weight gain. Efficiency ratios may vary by country, but in general, a pig’s ratio should be in the 3:1 range. A low FCR means your pigs are efficiently converting feed into body weight. A high FCR indicates your feed program may need to be reevaluated. Consequently, the FCR affects the price for pork products. The margin can mean all the difference between a profitable operation and an unsuccessful one. Because there are many factors that can influence a pig’s feed usage and weight gain, planning a nutritional strategy is vital for a successful operation. How efficiently pig feed is converted into pig body weight can be a challenge. Growing pigs are generally self-feeders and eat as much as they want. Their daily intake increases with growth and they can eat approximately 4% of their body weight a day. What may affect a pig’s appetite, which can affect the FCR adversely, is what makes predicting feed consumption a difficult task. A pig’s environment can affect its food consumption and conversion. The ambient temperature of the pen must be kept in the thermoneutral range or it will have a negative influence on a pig’s appetite. Pigs that are cold will eat more feed. Pigs that are hot will eat less. High humidity can also reduce appetite, as can poor ventilation. Ambient temperature outside of a pig’s normal temperature range will affect animal density in the pen. A decrease in area per animal will increase stress and result in a decrease in consumption. During feeding, pigs crowding together to stay warm means less space per pig at the trough, and less consumption. Sick pigs do not eat. Implement swine disease prevention strategies to protect your animals and maintain a healthy herd. Any infectious period can lead to loss in appetite and low weight gain. With a reduction in consumption, growth will be inhibited. One good measure is to ensure a pig’s gut health. Controlling microflora in the gut fosters nutrient absorption. Feed additives with probiotic microorganisms or organic acids can be periodically substituted for antibiotics to help lower the FCR. Genetics also play a significant role in converting feed into body weight. In fact, it’s been estimated that 30% of a herd’s success will depend on the genetic potential of the pigs. Crossbreeding pure bred pigs can achieve good characteristics, such as faster growth rates and better feed conversion rates. Many genetics companies rely on the Osborne FIRE® Performance Testing Feeders to measure daily feed intake and growth characteristics to help improve genetic selection. Finally, feed wastage may be difficult to measure, but it is an important factor in calculating your FCR. Osborne manufactures a variety of hog feeders designed to meet the needs of commercial pig farmers by minimizing feed waste to produce the best results. Osborne’s pig feeders will minimize feed wastage and maximize feed efficiency, and help automate pig feed conversion. The full-line of Big Wheel® round feeders promotes good feed conversion ratios for your pigs to efficiently turn feed into body weight. Feeder models are available for nursery, finishing, wean-to-finish, and lactation feeding. 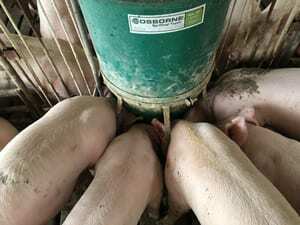 Osborne feeders take your pigs from farrowing to market with equipment that will reduce waste and completely optimize the feed efficiency of your entire herd.